Okay, first of all, I need to explain why I chose to add Xeikon to the production inkjet series, when in fact they really don’t currently have any solutions based on inkjet technology. The primary reason is the introduction of the new Xeikon Trillium One continuous feed liquid toner press, which is designed to compete against both dry toner and inkjet presses, but more on that later. If you haven’t been paying attention over the last two years, in April of 2014, the Flint Group—with more than 137 locations worldwide—was acquired jointly by two significant players; the financial powerhouse Goldman Sachs and Koch Industries, one of the fastest growing global conglomerates. With new resources and drive, it didn’t take long for the Flint Group to make its intentions known and to significantly grow its portfolio with the acquisition of Xeikon in December of 2015. This, its first acquisition, expanded the Flint Group business beyond just making ink. With the acquisition of Xeikon, Flint has now made a statement that it wants to make the equipment that drives the consumption of the ink as well. And while Xeikon is the first press manufacturer acquired by the Flint Group, I expect that there will be additional acquisitions in the future, with the potential of creating another very significant player in the digital production print space. Perhaps some inkjet technology might be in the horizon for Flint? Xeikon has a long history of manufacturing and implementation of toner-based printing systems. The company designs and manufactures its own LED imaging bars, manufactures its own toners, and has been successfully designing and building substrate transports since its first shipment of the DCP-1 in 1994. We are all fairly familiar with the dry toner, electrophotographic process that is at the heart of most of the digital print equipment in use today. Over the years we have seen, and been impressed by, the ability of the equipment manufacturers who have really pushed the limits of that technology. The quality has been able to reach the bar established by offset, making it a full-fledged competing print technology. However, as the adoption of this digital technology has grown, the ability to increase print speed and width have become the true barriers to further expansion. While the market looks to production inkjet to overcome those limitations, the fact is that liquid toner technology can actually overcome many of those current limitations. I was first introduced to the Trillium technology in February 2012 in the run-up to drupa that year. In fact at drupa, Xeikon showed a single color Trillium technology demo on the second floor of its booth. At the time of my introduction, I was very impressed at what could be accomplished with Liquid Toner technology. Not just the fact that it could overcome the limits of dry toner, but that it could do it at a lower cost as well! Well, now Xeikon is introducing the Trillium One, a four-color press using the Trillium technology that was designed for direct marketing, catalogs, and then some. Xeikon has a reputation for producing prints with a high print contrast and pigment load, so producing higher quality print is in the company’s wheelhouse. The imaging resolution of Xeikon dry toner presses has always been fairly remarkable at 1200 x 3600 dpi. In the past, to demonstrate what this means, some Xeikon employees had the Declaration of Human Rights printed in 1-point type on the back of their business cards, and amazingly, it is readable with a loupe. In fact, Xeikon’s dry toner equipment has just received approval by the Belgian government to print the official Belgian tax stamps. To ensure the security of these stamps, which in effect are considered a currency, it requires a level of detail that would be hard to replicate in most printing processes. For the Trillium One, Xeikon has maintained the 1200 dpi variable dot density as it has with its current dry toner line. The success of this technology is based on two primary principles; microgapping and liquid toner. In the diagram below, you can see the imaging system. There is an identical system for each color within the press. Microgapping is best described as a 5 micron gap between each of the touch points in the imaging system. That would be between the anilox and the doctor rollers, the doctor and the photoconductor drum, and the photoconductor drum and the intermediate drum which then transfers the toner to the media. These microgaps provide the mechanism to accurately and efficiently disperse the liquid toner. The concentrated Trillium liquid toner, called TONNIK, will initially be sold in 10 liter pails and is uniquely manufactured. Xeikon indicated there are plans to supply toner in larger drums for high volume installations. TONNIK starts as a resin that is the same as for Xeikon dry toner formulations and milled to 1mm particles. It is then further milled to10 microns and blended with dispersing agents and a carrier liquid. Then using high speed liquid milling equipment, the particles are reduced to a 2 micron disc shape. The resultant particles, when mixed with the special dispersing agent, create particle stability that repels adjacent particles. When the appropriate heat is added in the imaging process, the dispersion stability is reduced/removed facilitating the particles merging together. The carrier liquid is a high boiling point clear white oil that is nonvolatile and nonconductive. The bulk of the carrier liquid is removed mechanically during the natural layer splitting in the microgapping process, while a small portion is transferred to the substrate with two additional removal steps in place during the non-contact and contact fusing. All retrieved carrier liquid is reused. The de-inkability based on the Ingede Germany test is 94%, which is the same rating Xeikon has achieved for its dry toner solutions. The system is designed to reduce environmental impact. In addition to fact that there is no evaporation of the carrier oil, only recycling, there is also no supplemental drying required as is required with inkjet. The following video illustrates the movement of the toner particles between the anilox and the doctor rollers. Here you can see the initial dispersal of particles. The next video illustrates the particles moving between the doctor roller and the photoconductor drum. You can see that the particles have been dispersed even further based on the image requirements of the photoconductor. Finally the particles are transferred to the media, with the remaining carrier liquid being both removed and transferred as seen below. The result of this process is a very smooth print, without the ‘raised feel’ of a dry toner print. The Trillium One transport follows the established transport model of the predecessor Xeikon dry toner presses since 1994. It is a tower configuration, which enables the Xeikon presses to have a compact footprint of about 16 x 30 feet. It has a 19.7 inch print width and prints at 200 fpm (60 m/min). (Xeikon reports that in the lab, it has demonstrated that Trillium has the capability of running at double that speed.) The targeted volume is 5 to 15 million A3 prints/month. There is no optimization or precoating required for the fusing process and the fusing temperature is relatively low, which should enable a fair amount of substrate versatility. Xeikon is in the process of certifying substrates, and will release the information when available. 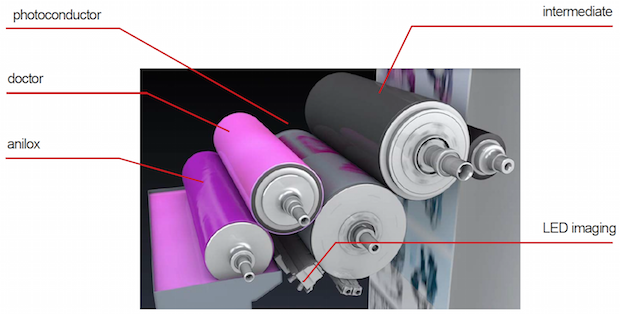 According to Xeikon, since there are no inkjet heads or printing plates that can compare to the efficiency of the microgap and toner process; in addition, Trillium One produces a print that is actually less costly than dry toner. And in cases where there is ink coverage above approximately 40%, it is even less costly than production inkjet. This presents an interesting challenge to the production inkjet landscape. While it appears that the Trillium technology has the potential to be applied in multiple market segments, including packaging, Xeikon has chosen to focus the Trillium One press on the document printing market. Like the other Xeikon presses, the Trillium One is driven by the Xeikon X-800 DFE. This DFE, based on the Adobe PDF Print Engine (APPE) can also support AFP/IPDS at the rated engine speed. Xeikon also developed Vectorizor to generate die cut files, Color Control to generate ICC profiles and spot color libraries, a Barcode module for generating 1D or 2D barcodes, Impactor to create impositions, and ColorKey to monitor and analyze the quality of production. Unlike many of the electrophotographic press manufacturers, Xeikon does not use a click charge model. Its presses are sold with maintenance programs, and the consumables are purchased as needed. The Trillium One is scheduled to start shipping Q2 2017 and will be demonstrated at drupa. The Xeikon drupa stand will include a virtual reality experience that allows visitors to “see inside” the press as it is running. At Labelexpo last fall, Xeikon introduced its new Fusion Technology targeted at the high end label and packaging market. This technology is designed to be one single modular platform that is flexible and can be changed to support current and future needs. It can support colors beyond the 4-process colors, but it can also support other ‘all digital’ embellishments, currently including; ScreenWhite, Tactile Varnish, Spot Colors, Braille, and Hot and Cold Foil. Xeikon will also be showing its new Folding Carton Suite at drupa. 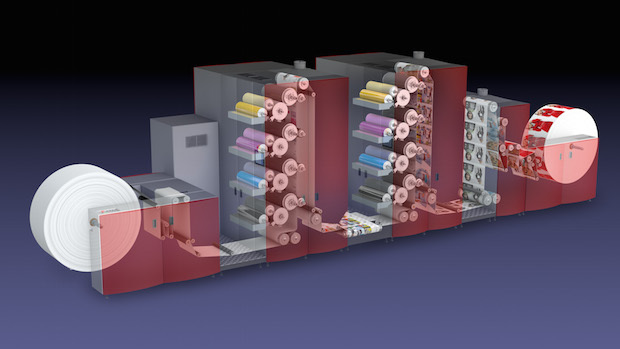 Based on its 3000 series presses, this solution provides an end-to-end solution for folding carton production, including 5-color printing at up to 63 fpm. The company has also developed the Xeikon FDU (Flatbed Die-Cut Unit). This operates at 2000 sheets per hour with a maximum die cut size of 19.2 x 27.6 inches. It can support 160 to 890 micron thickness including microflute corrugated. It is designed to quickly and accurately automatically register the sheets for cutting and creasing without time-consuming set ups. Xeikon dry toners are available in CMYK, Red, Green Blue, Orange and Extra Magenta. In addition Xeikon offers a one-pass opaque white and a clear, and can make special brand colors. Xeikon also makes toners specifically designed for PD substrates, thermal transfer labels, and clear and metalized film. Its QA-I Dry Toners meet FDA guidelines for indirect food contact. Xeikon has always made good products, but now it is also a company to watch. While Xeikon has always been a very innovative company with a lot of drive, with the new resources and drive of the Flint Group investors, the company can now continue to dream and develop. I hope to bring you lots of detailed information as we did in the past to prepare you for your visit to drupa. Or if you are not going, to prepare you for your investigation into production inkjet and other acquisitions. In advance of the next wave of articles, I would suggest that you do a ‘review’ of the original production inkjet and workflow series’ as a refresher. It not only covers the vendors and machines that have made it to market, but also the driving technology, requirements and impediments.